English is a complex language, even after years of education it is easy to mess up. Words and phrases may sound fine in your head but then when you write them down it doesn’t seem right. This is a list of common errors made in the English language. Hopefully this list can help clear up some confusing words of phrases we use everyday. This one still trips me up, as you have to really think about it. it is not a word you just write down and know which to us. 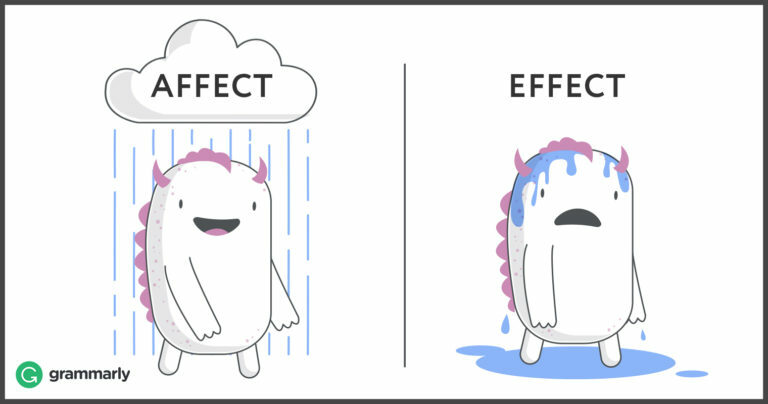 Affect with an “a” is the act of changing the verb, whereas effect with an ‘e’ is the act of changing the noun. So, if A affects B, B experiences the effect of A’s action. Confusing I know! The basics is to think of if affect/effect is referring to the verb or noun in the sentence. The above comic can also help you to remember. This one drives me crazy, as it is actually an easy one to use and understand but so many people use the wrong to/too. Especially when texting. Hopefully those reading this will never mix them up again. “To” is typically used before a noun or verb, and describes a destination, recipient, or action. 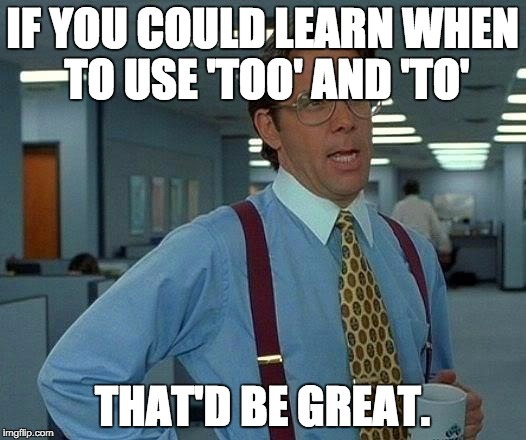 “Too,” on the other hand, is a word that’s used as an alternative to “also” or “as well.” It’s also used to describe an adjective in extremes. The basics is that if the phrase refers to going somewhere or acting upon something it is to. If you are referring to as well or an extreme then it is too. I hate to break it to you but alot is not a word and should never be used. If you are referring to a large quantity of things, then you would use a lot (two words not one). Then the other allot (not commonly used) is if you are going to set aside money to buy something then you would allot the money. Now this one is pretty easy to remember and once you have it you wont forget it again. Then you will be thinking, how do people get this one wrong. “It’s” is only ever used when short for “it is”. “Its” indicates something belonging to something that isn’t masculine or feminine (like “his” and “hers”, but used when you’re not talking about a person). The matter of how to refer to oneself causes all manner of conundrums, particularly when referring to another person in the same sentence. Here’s how to remember whether to use “me”, “myself” or “I”. When referring to yourself and someone else, put their name first in the sentence. Choose “me” or “I” by removing their name and seeing which sounds right. You only use “myself” if you’ve already used “I”, making you the subject of the sentence. This one gets confusing as desert has two meanings, while dessert has just one. So the easy way to remember this is to remember the saying that once you eat one dessert it is so delicious you want another (two desserts, two ‘s’s). The two meanings of the word desert are as follows: the first is a noun or adjective meaning a dry, desolate area, especially one covered in sand, waterless and usually hot during the day and chilly at night. The second is to abandon, to leave someone or something. The words lose and loose are often mixed up in writing. 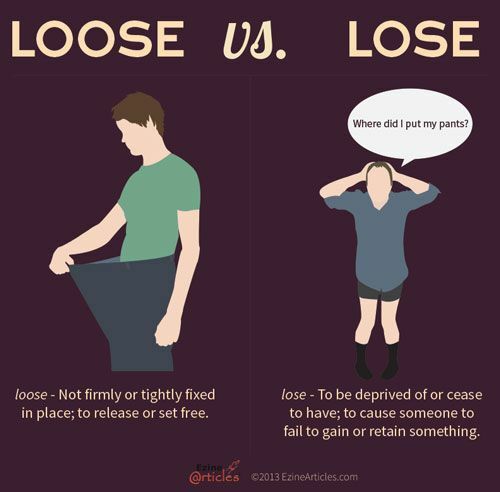 Lose is a verb that means “to fail to win, to misplace, or to free oneself from something or someone.” Loose is an adjective that means “not tight.” Think of loose as rhyming with goose. If you say the word correctly, you will know which one to use when writing them down as lose and loose have a different sound. This one can be confusing but there is simple trick you can use in order to figure out whether you should use who or whom in a sentence. Whom should be used to refer to the object of a verb or preposition. 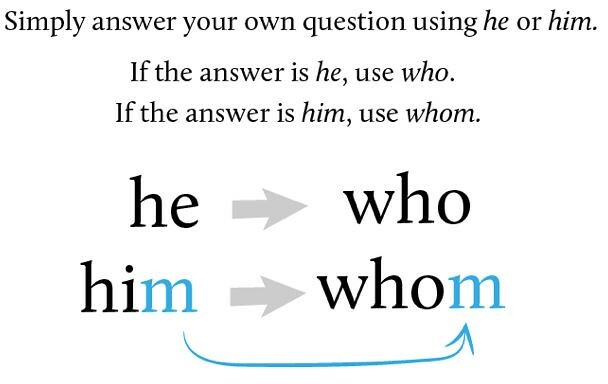 When in doubt, try this simple trick: If you can replace the word with “he”’ or “’she,” use who. If you can replace it with “him” or “her,” use whom. 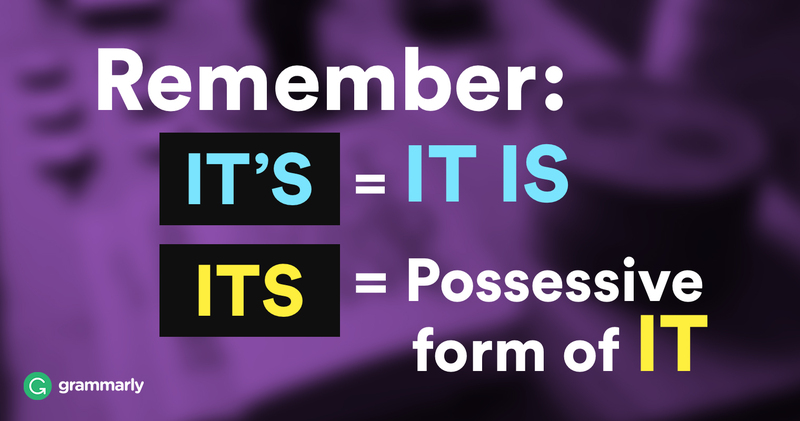 Apostrophes aren’t difficult to use once you know how, but putting them in the wrong place is one of the most common grammar mistakes in the English language. Apostrophes indicate possession. To indicate something belonging to one person, the apostrophe goes before the ‘s’. For instance, “The girl’s horse.” To indicate something belonging to more than one person, put the apostrophe after the ‘s’. For example, “The girls’ horse.” Apostrophes are also used to indicate a contracted word. 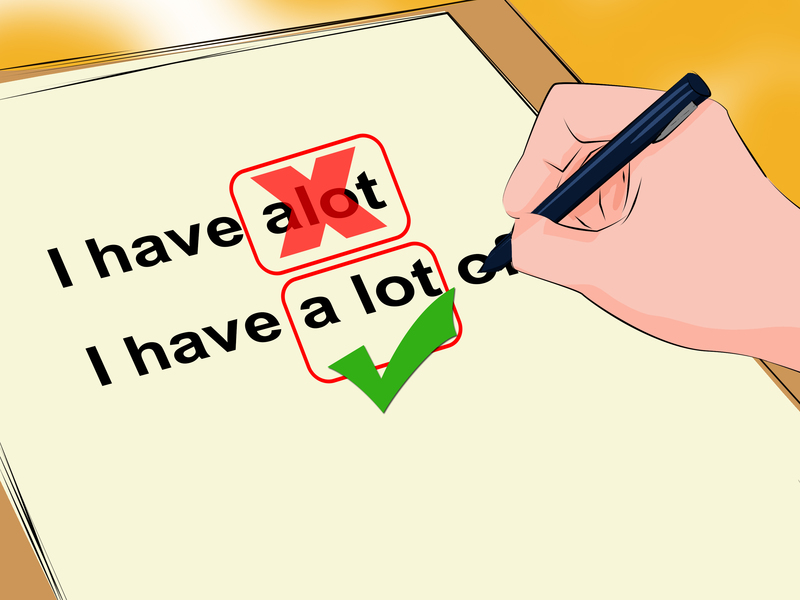 For example, “don’t” uses an apostrophe to indicate that the word is missing the “o” from “do not”. Apostrophes are never used to make a word plural, even when a word is in number form, as in a date. I have always found this one confusing but there is actually a really simple rule. The difference between practice and practise mainly comes down to British vs. American spelling. In British English, practise is a verb and practice is a noun. 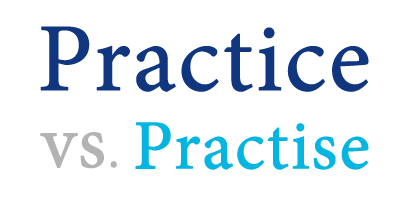 In American English, practice is both the noun and verb form. American English doesn’t really use practise. So the bottom line is that if you are living in the USA, don’t even worry about using a ‘s’ in the word, that word does not exist in the USA!